We are at the California State Championships this weekend, but before the tournament kicks into full swing, I wanted to share an organic, low-calorie product that has been in my carry-on luggage the last two weeks! When a health conscious person is always on the go, some days it can be hard to get your produce in. While I always attempt to grab some local fruits and vegetables when we get to a location, it can be difficult to travel with a variety of fruit and I believe that variety helps prevent unhealthy eating. Luckily, there exists in this world a company that dries and packages individual servings of fruits without any added sugar. 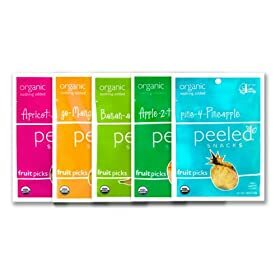 Peeled Snacks have six different fruits to choose from: Cherry-go-round, pine-4-Pineapple, go-Mango-man-go, Banan-a-peel, Apricot-a-lot & Apple-2-the-core. They also offer variety packs as well as fruit and nut mixes. While dried fruits are often higher in calories, Peeled Snacks lowered the calories by keeping the added sugars out of the mix. The fruits are all organic and tasty to boot! Every fruit is full of flavor and the servings are big enough to satisfy your cravings for sweetness. This product has been tested by this debate coach as well as my high school students. We all agree that for health conscious travelers, Peeled Snacks is a must have product. Every flavor tastes like real fruit and the texture is perfect. Right now Peeled Snacks is offering readers a $10 gift card just for going to their site and completing a short survey. Pineapple (one of my two favorites) and Apricot are also on sale for a couple more days. Act quickly to get in on the double savings! Those look really neat! And I love your chicken apple pockets below! These sound great and good luck with the championships! Awesome and best of luck!!! those look good, I'm going to try them out! Nice feature - I was super involved in Debate in Texas during high school and college and can say with 100% certainty that nothing we ate was this healthy, tasty or close to resembling real food!